Thanks for your submission, Jim and Betsy. For those that don't know who you are talking about, it is Simione Daveta, who runs the Suva City Tours. You can find his page on this website by following this link. We spent a day and a half with Simmie showing us around Fiji. The man is amazing, very intelligent, and truly fun. He seems to know everybody, because he is a really good soul and helps so many of his country people. He is an entrepreneur, and finds ways to have you see things that others will never even know existed. And he will use his knowledge and resources to find ways to delight you. As one example, we drove by a tiny airport that had just an open pavilion and were intrigued. So Simmie said "let's go check it out", and we did. Our advice is let him know what you want, trust him, and get ready for a very special experience. 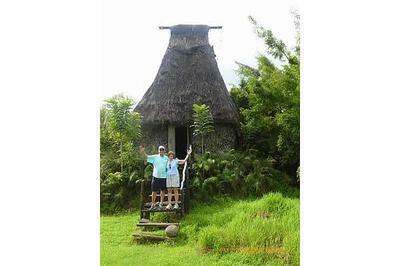 Arranged a day tour for our party of 5 with Simmie Daveta several weeks prior our Cruise Ship arrival in Suva. Sent a deposit at his insistence via Western Union and received advice on meeting on arrival. Guess what....no Simmie on arrival which was rather disappointing and really stuffed our day up. Friends, SIMMIE is an outstanding guide and local Fijian who made my 30th birthday special. He cracked a coconut for us, handed down a towel on our laps and even surprised us with bringing along straws. Amazing foresight! He took us on a tour of the city going places you wouldn't normally go. Taking us to sights that the buses don't. Lunch overlooking beautiful tropical rainforest and got us cheaper Zipline tickets. His attention to detail, knowledge and caring nature ensured us a phenomenal time whilst in Fiji. I cannot wait to return to Fiji just to say hi to our new friend Simmie. A gentleman guide not to be missed. Cheers!! And Simmie, You made my day, I really enjoyed our time with you. Vinaka, and Thank you!! Very caring and helpful with our plans for the day. Insightful, educated, interested, committed to providing a world class guest service. Full of smiles, engaging conversations and knowledge that was really useful on our trip. You a friendly guide that made our stay awesome! Professional, cheerful and with every effort to making the travelers relaxed and comfortable. Great! You are very knowledgeable and communicate well. Your can-do attitude and high spirits gives an amazing Fiji experience. This is what all guides should be like. Well done! Can I give you 11 out of 10 ??? The attention to details was impeccable, thank you Simmie. You are a champion! Kindest Regards from the Gold Coast. I want to thank you for the wonderful experience we had with you while in Fiji. The itinerary options you presented to us were very interesting. We would have loved to choose all three options for the day, but our ship was only in town for the one day. Our days in Lautoka and Suva were terrific. We enjoyed the sharing of your knowledge of the culture, visiting the village, meeting and talking with the people of the village, the tour up the river to the other village, the waterfall, and the rafting trip back. personality and political intelligence and willingness to take us anywhere at anytime was perfect. Your flexibility matched our needs. I would highly recommend YOU and your tour company to anyone that needs to see Fiji the right way. Thank you again from your friends in California. Bula! Thank you for the post! I probably passed Orchid Island Cultural Centre, yet didn't visit. Will definitely do so next visit...and I'll ask for Simmie! Vinaka! Join in and write your own page! It's easy to do. How? Simply click here to return to Simmies Tours.